I agree that cellphone AR will be the thin end of the wedge that ushers in wider awareness of AR games. We’ll see more AR ad gimmicks like the virtual Minicooper. I think some chain stores like Starbucks will plant AR “Easter egg” stickers in stores for people to find with their cellphones. I think the very first commercial AR game will arrive when some Wizards of the Coast game company makes their collectible cards come alive when shown to your webcam. Or, how about a 3D puzzle/toy that you manipulate in front of your webcam which transforms a corresponding magical creature overlaid on you hands in screen space? Not strictly AR but… I predict that an arcade shooter game will add simple face tracking via webcam. You’d get both a first-person immersive 3D effect (ala George Ou) and an intuitive peer-around interface for very little incremental development cost. In the same way, the next DDR dance game could eliminate the dance pad by tracking disposable foot and arm bands. Your 3D toon avatar could be overlaid on video so you could see your audience behind you. I can expect that the (and pardon me for how diabolical this sounds) conditioning and training of the masses will happen by way of mobile phone apps and gaming apps that use this already. We’ll see more plugins for the desktop, certainly. What I’d like to see, but probably won’t this year, is the advancement of display tech, since we have a) data b) input mechanisms already. My personal focus is on alternate reality games + augmented reality, which makes a good platform to get people out of the house and into the world by way of their portable devices. Yes, video recording on the iPhone will happen this year for sure. Apple arnt stupid, a lot of AR apps for the iPhone could well become saleing points. For 2009 I see location based app’s going mainstream with most people using some-sort as they buy new mobiles. True AR use will still be low, but I think the -term- will at least become more widely known. Wikitude, and app’s like it, will start to become the reason people upgrade their phones. I think we will see a few very basic AR games on Nintendos DSi, possibly just as downloadables. Sadly, I agree with Eric that display tech wont advance that much. I’m trying not to get my hopes up about the Vuzix, it seems a bit -too- good for the moment. Above all else though, I hope this year some universal standards for AR are established. corrisponds to a URL, which contains a 3d mesh and textures to display at that location. This should be rather easy to make, but the key is getting everyone to use the same standard. We dont want to be stuck in a situation where every company wanting to do an AR advert gets the user to download their own application *and then* they point it at the marker. The standards should be there so that people with the software can point at any marker and see the model overlaid. The markers we use should become links. S Jones- The game you discribe already exists, its called “Eye Of Judgement” on the PS3. The Wii has shown the way– augmented reality is going to come very incrementally. I see things like iPhone apps that take better advantage on the phone’s tilt sensor. I also see an opportunity for augmentation in the social media space. Everyone is very focused on gaming (which makes sense), but I can see augmentation that extends on an application like, say, Loopt. Mixing GPS with social networking, and taking it a step further… like I say, incremental. I can also see it coming into play with geo-targeted marketing, cross referenced with a user profile. With HMDs, it is all moving frustratingly slowly. I wish Apple would jump into the space, but I’m sure, like phones or even mp3 players, they will be a fast followers in a mature market. It’s not a space I expect them to trail-blaze in. 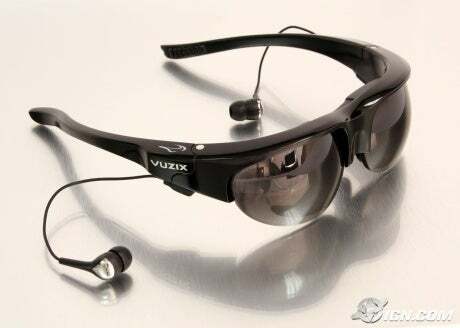 I will be interested to see what, if any, stir the the new Vuzix eye-wear makes in the mass market consumer space, outside of the niche market of people already into this. I think vuzixs device will be a huge hit, but amongst professional and buisness use. All those companys (of which there is a fair number) using AR technologys in their design work will jump at the chance of using an off-the-shelf solution rather then custom jobs. Having something like this to hand to a client and say “”hay, this is how the new building/aircraft/car will look!”” is going to be a very powerfull tool for them. I expect Vurzix will target the price for expensive for this reason, allthough in the long run its profitability will be a good thing for us, as models are refined and the lower end ones become affordable for typical iPhone and Andriod user’s.